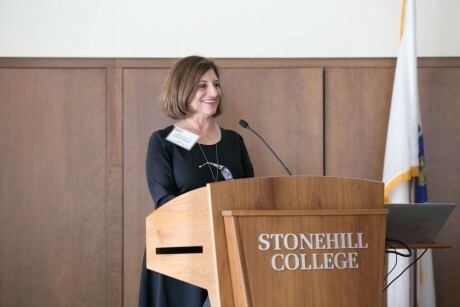 In her keynote address to the inaugural Alumnae Summit, Saturday March 10 in the Shield Science Center at Stonehill, Judy Salerno M.D. '73 offered three life lessons to women graduates based on her career in science and medicine. Thank you for inviting me to join you today. I’m thrilled to be here with my fellow Stonehill alumni. Even though I am separated from most of you by a generation, I’m sure that you, as I do, reflect back on your years at Stonehill as a time of personal growth which set the foundation for the current direction of your lives. I am grateful to the College for the time I spent here. Well, the interviewer was for sure irreverent because my responses did not fit the theme they were seeking – how tough it still is for women in medicine. I won’t deny that there have been enormous challenges but I hope to provide you with a few anecdotes from my personal journey which may offer some food for thought. My career has been quite eclectic – I often refer to it as my checkered past. I’ll give you a very condensed version: I went from graduating from Stonehill as a history/college studies major to being a community organizer. From there went to grad school in public health, worked in health policy and global health for six years (including a half year living in Egypt) then back to school for pre-med and medical school (launching my second career), then internship, residency and fellowship, then a number of years as a biomedical researcher at the National Institutes of Health, followed by a leadership position at an academic medical center, a program head for the VA health system nationally running over $3 billion of health system programs, then back to the NIH as a deputy director of the Aging Institute. After that I spent about seven years as an executive officer at the National Academies of Sciences in DC, followed by a term as CEO of Susan G. Komen, the world’s largest breast cancer organization, and now, for the past almost six months, as President of the New York Academy of Medicine. With few exceptions, I changed jobs every five or seven years. That’s my cycle. More about that later. While I was being glib, I believe my response reflect what many women feel, especially while thinking about the oft-cited but elusive “work-life balance.” I often felt inadequate at both my work and home life. I was never happy with simply doing a ‘’good enough’ job. I always felt that I was falling short. Many “IF ONLYS…” If only I could manage my time better. If only I spend more time with my kids. If only I had done X or Y… Some refer to this as an aspect of the imposter syndrome – feeling that you really don’t belong at the level you’ve achieved. It’s unfortunately often a girl thing. Let’s face it – women excel at being jugglers and problem-solvers because of many competing demands on our time, whether or not we have children. It took me a while to stop beating myself up for doing things like buying cupcakes instead of baking them for my kid’s school birthday party. But the reality is that work-life balance is an aspiration and perhaps even a myth. The way to survive and even thrive is to accept that you can and will learn to live a life off-balance – and live it well. Let’s face it – women excel at being jugglers and problem-solvers because of many competing demands on our time, whether or not we have children. If only we were self-confident enough to believe that! The old expression that “if you want something done, give it to a busy woman” is true (paraphrasing Ben Franklin). Lesson One: Learn to live and enjoy living a “wobbly” life because your priorities will always be shifting. You can do it. And don’t let the bad days make you doubt yourself. Another issue I confronted in medicine was so-called lack of role models, in my case, women physicians in leadership positions. While I believe that role models are important, especially in our formative years, and DO make a difference in how we view our options, they should not be determinative. Some of the women physicians I often encountered early in my career were, in some ways, negative role models. I remember a woman cardiologist who worked up until she went into labor. I was appalled by that and said “not me” but wound up doing the exact same thing. Made rounds on my patients then took the stairs up two flights to Labor and Delivery. Why? Because my hospital did not provide any maternity leave so every hour that I took off prior to my child’s birth was an hour less than I had with my newborn. I decided that I needed great mentors, not role models to whom I looked at from afar. People who could help guide me, provide advice and, yes, nurture me. I found several of those mentors at the National Institutes of Health, including someone who was the first woman institute director – a real pioneer - who raised her children in campus housing so that she was never far away from work or home. You need to seek out a person – a woman – whom you admire. Observe them, engage them, become friends, use them as sounding boards, and the mentorship will follow. I believe that these mentors pass on to you what I think of as the INHERITED WISDOM of generations. Stay in touch with them throughout your career. Second Lesson: Role models matter but mentors are far most important. You need their wisdom and inspiration. And they will be your cheerleaders. Another pitfall I fell into is accepting when people undervalued me. Let me give you an example: when I decided to go back to medical school, I realized that it would be a very long journey. I was continually told why I could not do it. My chemistry teacher told me that he felt I was unable to learn science because of my advanced age – all of 29. I credit him for motivating me to get an A in his course. But then he would not write me a recommendation for medical school (and he thought that applying to Harvard was sheer madness) so I went to the department head and received a recommendation which helped get me admitted to Harvard Medical School. I was so pleased to go back to the chemistry guy and show him my acceptance letter. Another example: after my third baby, I was doing research and my lab chief took away my research protocol (which I had written and developed) because he said that a women with three kids could not possibly manage such a demanding clinical protocol. I left that institution – found the exit ramp - but came back as few years later --- as his boss. It was a sweet moment, I will admit. I decided that I needed great mentors, not role models to whom I looked at from afar. People who could help guide me, provide advice and, yes, nurture me. These were two pivotal moments in my career, where I did not let others define my goals. While the sort of blatant gender bias would not be tolerated today, it still exists but in more subtle and perhaps more insidious ways. And be alert to how people are defining you - or paying you or promoting you (or not) – especially relative to others in your organization. Make sure they are playing fair. Their status quo may not fit your aspirations. So don’t be afraid to change jobs, when you need to, find a new status quo, and welcome new challenges. I will never regret scratching that five to seven year itch when I changed jobs. Last week I went to a discussion with Michelle Obama where she recounted that she was told that she was not “Princeton material” when she was considering where to apply to college. You know the end to that story: Princeton, Harvard Law, health system executive, First Lady of the United States. Q.E.D. Lesson Three: Don’t undervalue yourself even if others try to. Refuse to accept limits that others set for you. Define success for yourself. I don’t have time to go into great detail but I’d like to mention the importance of having a network and using that network of trusted, loving individuals, peers who can provide support and lift you up when you need to be lifted. In 1978, when I was working in the federal government in health policy, a dozen women started a monthly meeting group: the Women’s Health Policy Poker Group. We talk together, ate together, and shared a lot. Suffice it to say that it’s been many years since we’ve gotten out the poker chips but after 40 years, we are still friends and, in fact, the same dozen women are still getting together whenever possible. My go-to girlfriends and lifesavers! It is empowering. I’d like to leave some time for discussion so I’ll close with giving you a question to consider – one that I am frequently asked: Which historical figure do you admire? For me, that person is Eleanor Roosevelt. She was an activist, an advocate, outspoken on issues of social justice, a diplomat and a hard act for future first ladies to follow.